Taste characteristics: This nutty, pecan flavored 2010 wild brick not only has improved packaging, it is actually sweeter and more flavorful than its older version. For those who like the 2009 brick, you will like the 2010 edition even more. We are also very proud to announce that the new Denong Wild Brick has received the SGS Food Safety Certification, issued by the Global Food Safety Initiative (GFSI). 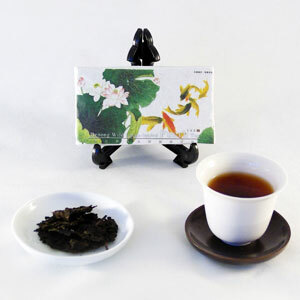 Bana takes great pride in offering you this very healthy ripe Pu-erh tea. This ripe puerh is a wonderful example of how balanced a ripe tea can be at only 8 years old. Wonderful fragrance from the tea as soon as the water hits the tea leaves. A mild and gentle experience on the mouth and throat. A quiet fullness in the body as this tea moves throughout the torso. A very clean and calming experience that every puerh lover will enjoy. The energy of this tea is balanced mature fire. Sweetness of dry fruits and somewhat honey with amazing aroma, makes you feel warm and cozy. I love this tea. This is the first time I have tried it and I find it very smooth smooth and full of flavour. Just delicious!